For more information about the SellSafe program, please see the questions below. If the answer to your question isn't here, check the Frequently Asked Questions (FAQ) or SMART Programs Training Requirements pages. If you need more help, please contact us. 1. What is SellSafe Cannabis Staff Training? The SellSafe program is a mandatory certification program designed to help licensed retail cannabis store staff understand how to sell legal cannabis responsibly. SellSafe will help staff understand what their responsibilities are to their customers. The program also helps workers understand what Alberta's cannabis laws and AGLC's policies are so they can follow them. These rules help protect people working in the cannabis industry, their property, their customers, and the public from cannabis-related harms. SellSafe does not include information on all cannabis laws and policies. To work in Alberta's cannabis industry as a cannabis representative employee or as retail store staff, you must be recognized as a Qualified Cannabis Worker. SellSafe certification is required to apply. The SellSafe program is designed to help licensed retail cannabis store staff understand how to sell legal cannabis responsibly. The goal of the program is to ensure that staff have appropriate training to educate customers about the potency of products and the risks associated with cannabis use. Staff must also be trained to uphold the rules around the purchase of cannabis, including checking customers' identification to make sure they are of legal age. 3. What are the benefits of having a SellSafe certificate? SellSafe will help staff understand what their responsibilities are to their customers. The program also helps workers understand what Alberta's cannabis laws and AGLC's policies are so they can follow them. SellSafe does not authorize retail cannabis workers to give medical advice. Customers who ask for help or information to use legal recreational cannabis for medical purposes should be referred to their doctor or other medical professional. 4. Who has to be SellSafe-certified? Direct supervisors of employees of a company contracted to provide security. Sellsafe certification is also mandatory for managers, supervisors and all employees of a cannabis representative involved in the marketing, promotion and sales of a cannabis supplier's products. SellSafe certification is not required for staff working full-time or part-time as cleaning staff in licensed premises. Click here to see the certifications required for various positions in the liquor, gaming and retail cannabis industries, as well as the associated costs and timelines for each program. To work in Alberta's cannabis industry as a cannabis representative employee or as retail store staff, you must be recognized as a Qualified Cannabis Worker. AGLC's QCW requirements are online at aglc.ca. Prospective cannabis representative employees involved in the marketing, promotion and sales of cannabis products in Alberta, and retail store staff must be SellSafe-certified before applying to be a Qualified Cannabis Worker. 6. Who does not need SellSafe certification? More information about SellSafe's policies is in Section 1.7 of the Retail Cannabis Store Handbook and Section 2.3 of the Cannabis Agency Handbook, online at aglc.ca. Clear images of any of the above (i.e., image, photograph or screen shot) saved on the staff member's mobile device/phone). Licensees with uncertified staff could face penalties such as a warning, fine, licence suspension or termination. An industry worker's SellSafe certification will be immediately suspended if charged federally or provincially with the offence of giving, selling or supplying cannabis to a minor. See the Cannabis legislation and policies page of the AGLC website for more information. Policy and program content may change after industry workers are certified. Licensee staff are responsible for reviewing the program content, legislation and the policy handbooks to keep their knowledge current. Note: The information listed above may be kept in the same log as the Qualified Cannabis Worker log (s. 1.6.7 RCSH). This log is subject to review by AGLC. 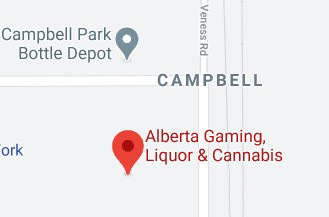 AGLC's liquor, gaming and cannabis policies are online at aglc.ca. 9. I have questions about my SellSafe certification. Where can I go to find more information?